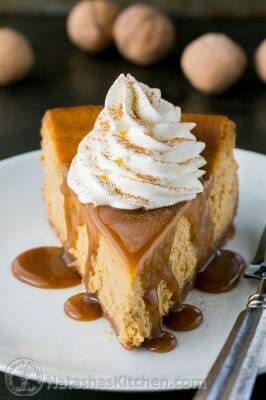 This pumpkin cheesecake recipe is easy and has just the right amount of pumpkin flavor. 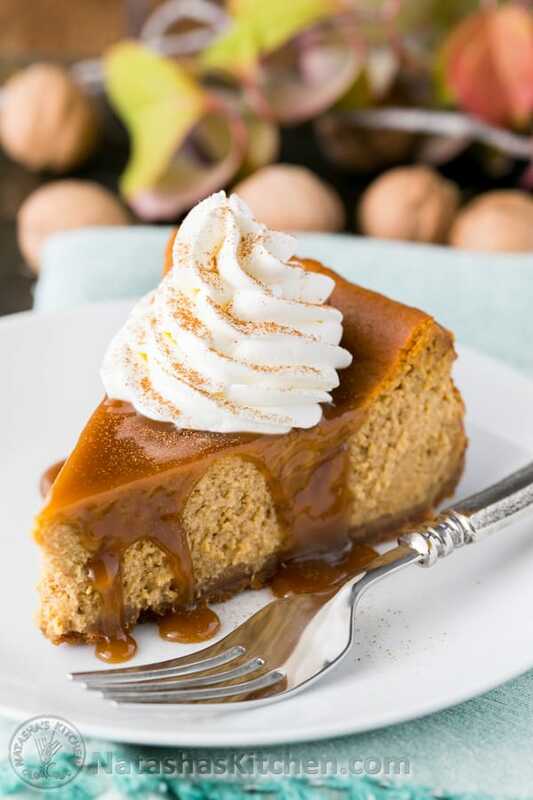 It tastes exactly like a cheesecake that crossed paths with a pumpkin pie – the best of both worlds. The only thing difficult about this cheesecake is waiting for it to cool down so you could eat it! 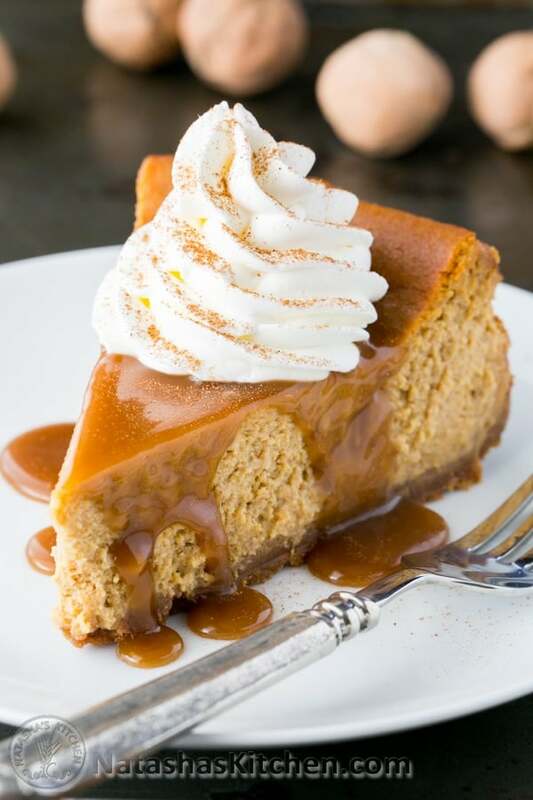 This pumpkin cheesecake is delicious by itself but is just over-the-top impressive when you add some of that caramel sauce and rum-infused whipped cream. This is the perfect holiday dessert. It’s inspired by Fall, makes your home smell incredible, and will have your dinner guests humming with delight. 1. Pulse graham crackers in a food processor until fine crumbs form. 2. 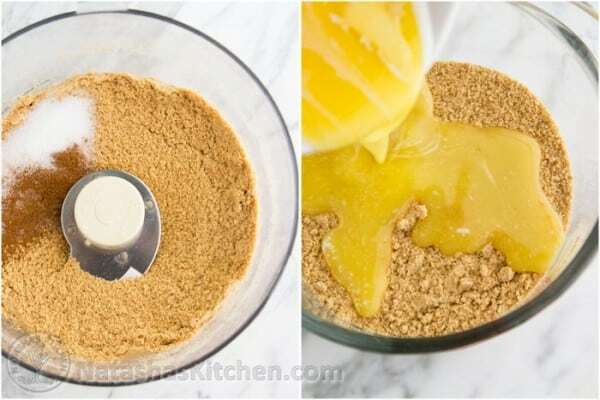 In a medium bowl, stir together 1 1/2 cups graham cracker crumbs, 1 Tbsp sugar, 1/2 tsp cinnamon and 6 Tbsp melted butter. 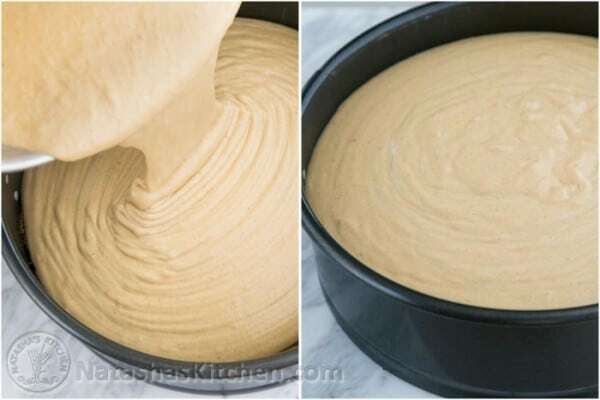 Transfer into a 9-inch springform pan with 3″ tall walls and use a large spoon to press crumbs into the bottom of your springform pan, and going about 1/2″ up the sides of the pan. Bake at 350˚F for 8 minutes. Remove from oven and cool to room temp. 1. In the bowl of your mixer with the paddle attachment, beat the 3 packages of softened cream cheese and 1 1/2 cups brown sugar on med speed until light and fluffy and without lumps (5 min), scraping down the bowl once to make sure you don’t have chunks of cream cheese. Tip: brown sugar is considered “packed” when it holds it’s shape as it comes out of the measuring cup. Have a taste of this cream cheese frosting. It would make a super yummy frosting actually! Just don’t eat too much. You need it for your cheesecake. 2. 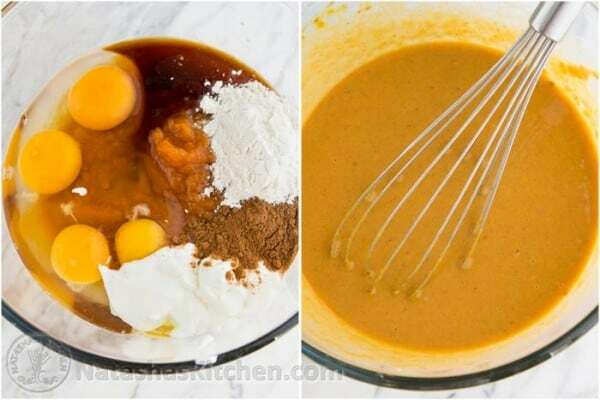 In a separate bowl, using a whisk, stir together 15 oz pumpkin pie mix, 4 large eggs, 1/4 cup sour cream, 2 Tbsp flour, 2 tsp pumpkin pie spice, 1/4 tsp salt and 1 Tbsp vanilla extract. Mix until well combined. Add this mixture to the cheesecake filling and continue mixing on low speed just until well combined, scraping down the bowl as needed. 3. Transfer filling into pre-baked crust and bake on the middle rack at 350˚F for 1 hour. Turn off heat, prop the oven door open slightly with a wooden spoon and let cheesecake sit in the oven another 45 min. Then remove from the oven and let cool to room temp before covering with plastic wrap and refrigerating. Serve when fully chilled (at least 4 hours in the refrigerator, or overnight). 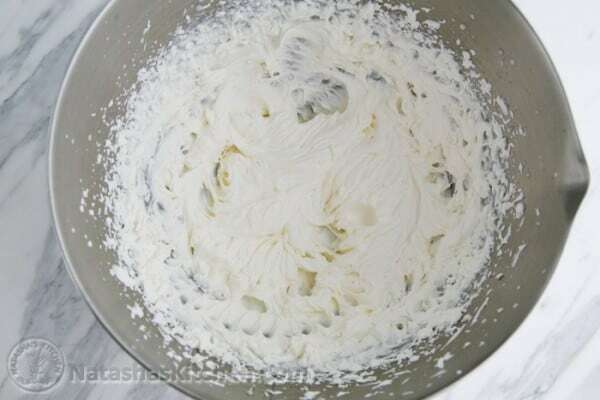 Tip: Freeze mixing bowl for 10 minutes to get the best whipped cream results. 1. 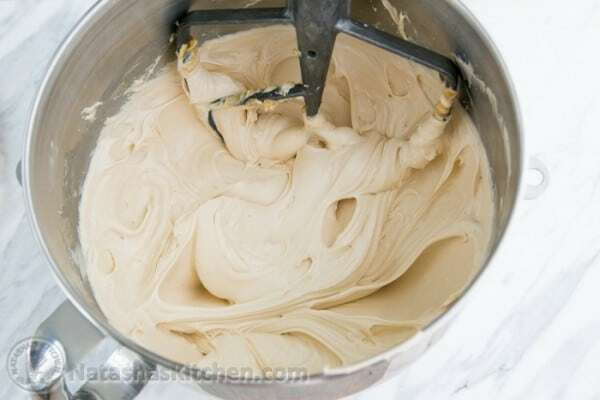 In a cold mixing bowl, add 1 cup cold heavy whipping cream, 1 Tbsp sugar and 1/2 tsp rum or vanilla. Beat on high speed until fluffy and spreadable. Don’t over-beat or it will turn buttery. It only takes less than 2 min to make fresh whipped cream. 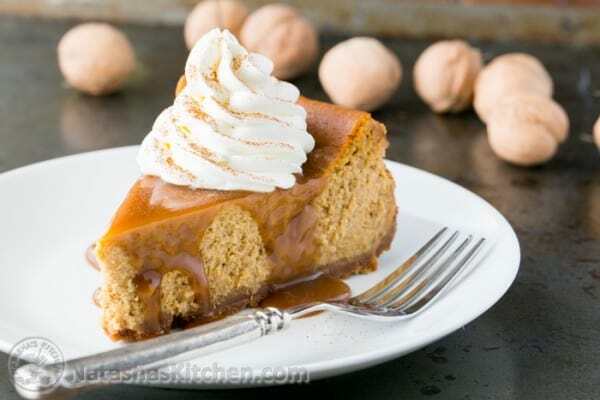 This pumpkin cheesecake recipe is easy and has just the right amount of pumpkin flavor. It tastes exactly like a cheesecake that crossed paths with a pumpkin pie - the best of both worlds. This pumpkin cheesecake is delicious by itself but is just over-the-top impressive when you add some of that caramel sauce and rum-infused whipped cream. This is the perfect holiday dessert. Pulse graham crackers in a food processor until fine crumbs form. 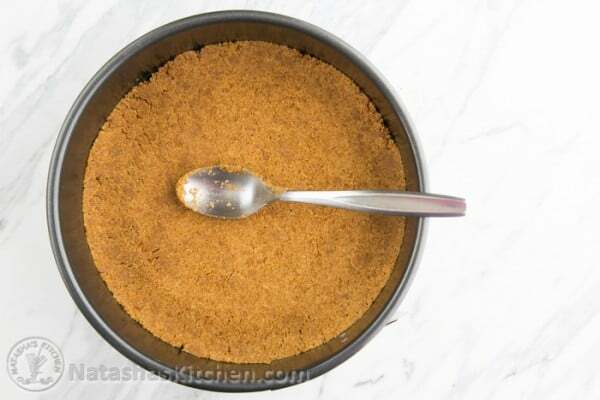 In a medium bowl, stir together 1 1/2 cups graham cracker crumbs, 1 Tbsp sugar, 1/2 tsp cinnamon and 6 Tbsp melted butter. Transfer into a 9-inch springform pan with 3" tall walls and use a large spoon to press crumbs into the bottom of your springform pan, and going about 1/2" up the sides of the pan. Bake at 350˚F for 8 minutes. Remove from oven and cool to room temp. In the bowl of your mixer with the paddle attachment, beat the 3 packages of softened cream cheese and 1 1/2 cups brown sugar on med speed until light and fluffy and without lumps (5 min), scraping down the bowl once to make sure you don't have chunks of cream cheese. 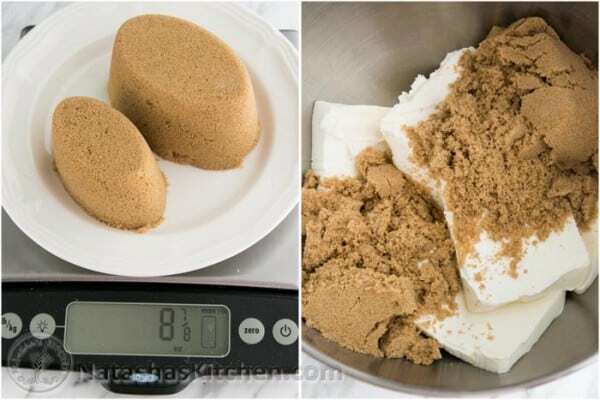 Tip: brown sugar is considered "packed" when it holds it's shape as it comes out of the measuring cup. Have a taste of this cream cheese frosting. It would make a super yummy frosting actually! Just don't eat too much. You need it for your cheesecake. 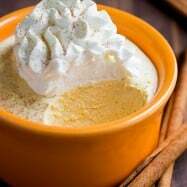 In a separate bowl, using a whisk, stir together 15 oz pumpkin pie mix, 4 large eggs, 1/4 cup sour cream, 2 Tbsp flour, 2 tsp pumpkin pie spice, 1/4 tsp salt and 1 Tbsp vanilla extract. Mix until well combined. 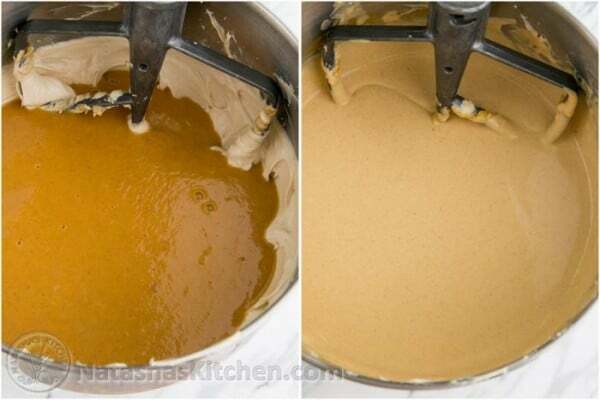 Add this mixture to the cheesecake filling and continue mixing on low speed just until well combined, scraping down the bowl as needed. Transfer filling into pre-baked crust and bake on the middle rack at 350˚F for 1 hour. Turn off heat, prop the oven door open slightly with a wooden spoon and let cheesecake sit in the oven another 45 min. Then remove from the oven and let cool to room temp before covering with plastic wrap and refrigerating. Serve when fully chilled (at least 4 hours in the refrigerator, or overnight). 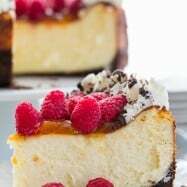 Before serving, carefully remove cheesecake from springform pan by running a blunt knife along the sides of the cheesecake to release from the springform mold. Add desired toppings (see list above) and serve. 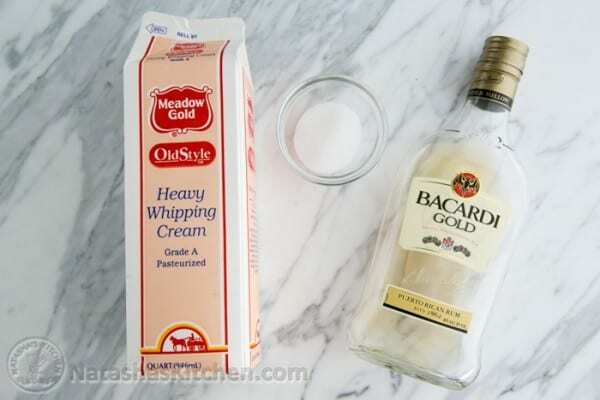 In a cold mixing bowl, add 1 cup cold heavy whipping cream, 1 Tbsp sugar and 1/2 tsp rum or vanilla. Beat on high speed until fluffy and spreadable. Don't over-beat or it will turn buttery. It only takes less than 2 min to make fresh whipped cream. After searching and looking at numerous recipes I kept coming back to yours. I made this for Thanksgiving and it was a huge hit! I made a pecan praline sauce to serve with it. I followed this recipe a couple years ago when my buddy had a bunch of crook-necked pumpkins from his farm. It came out great then. I like the way you think! I think your husband is a happy man and it’s obvious you put love into what you make and “bam” it in your own special, kind of twisted and caring way to better one’s experience. I’m looking forward to making this recipe for the holidays and thank you for sharing! Hi Natasha, I was wondering, if I cooked this in a 8”x11” pan, do you have any idea how long I would need to cook it for? Hey Natasha I know you posted this recipe in 2017 but I have made a smaller crust and I have a lot of mix left over and its too late to go to the store and buy another crust (I am to lazy to make my own lol!) could I just wrap it up and put it in the fridge overnight or do I Have to just throw it out? The best pumpkin cheesecake ever. I made this for thanksgiving this year. Everyone loved and enjoyed it. Can you freeze this pumpkin cheese cake? If not can the recipe be cut in half? How would the ingredients be cut in half if this is possible. What size pan would you use? 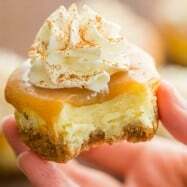 If the pumpkin cheesecake can be freeze, I would like to make 2 separate smaller cakes with one recipe. What size pans would I use to do this. Give one and freeze one. I made this for Thanksgiving and it was INCREDIBLE!! I went to Truluck’s that night and ordered their pumpkin cheesecake, and it tasted awful compared to this one. Could I use fresh pumpkin instead of canned? Would I need to add more pumpkin pie spice? as a website owner and blogger myself, i have to tell you how much i LOVE your site! gonna make my first cheesecake today – pumpkin, and i couldn’t do it without you. thanks natasha! Is it a 15oz can of pumpkin pie mix or 30oz can? I just want to make sure 15oz is correct because I’ve only seen 30oz cans in stores…and the picture you posted with the can looks pretty big too. Omg! your recipe for this pumpkin cheesecake is to die for. I actually did it as an activity with my little girls and the recipe was super easy to follow. My girls loved it and we enjoyed eating it after very much! I did pre-bake it and had it cool to room temp before I poured the batter. It’s possible I might have put more graham crackers then was called for. It enough butter and sugar to bind. Would refrigerating or freezing the crust help for the next time? 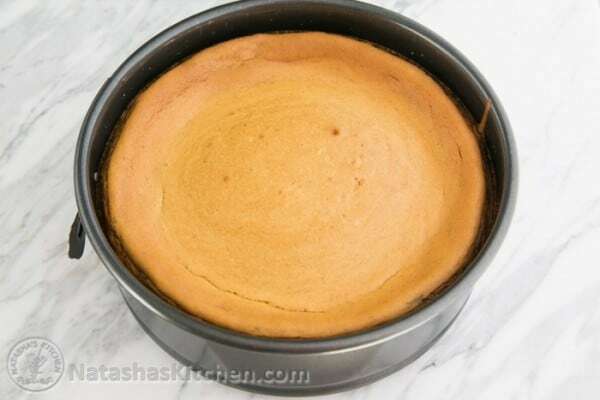 I made this Pumpkin Cheesecake recipe this weekend and it turned out fabulous! I actually made 2 smaller pies out of the recipe because I didn’t have the right pan. Hi I have a quick question. 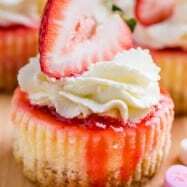 I am planning to make this recipe for my family this Friday and I was wondering if omitting half the required sugar would still work? 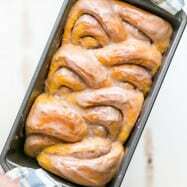 I don’t know anything about baking but I am concerned on how it will affect the baking process? I made this today the the whole top was cracked. I did everything that the recipe said. I don’t know what happened. It still was very yummy! But the caramel sauce made the cheesecake soggy a little bit. This is my second comment just to let you know that this time I used Light Cream Cheese and Light Sour Cream and it still turned out really good! My wife made this cheesecake exactly per the directions. It is SOooooo good. Oh my, the only reason it was a mistake to make the cheesecake so soon is that it may be eaten before my family gets any! Wow, the filling was totally delicious! & that was just living the beater & bowl clean! This is going to be a hit! I tried to make fudge brownies with the cheesecake batter swirled in, but apparently they have different baking conditions – the pumpkin part wasn’t done and the fudge part was dry. Oh well. Oh bummer! It is a good idea though. Thanks for sharing that with me. I did some research because I have learned in the past my glass pie pan can be tricky to bake with. 2 special changes for the glass 9-inch pyrex pie pan: I did not pre-bake the crust AND I cooked it at 400′ for 45 minutes, taking it straight to the cooling rack (I did not leave it in the oven any longer). I used about half of the mix to avoid any overflow. Today I will make mini-cheesecakes with it! This recipe is wonderful! The cheesecake has been a huge hit! It is so rich and delicious! The recipe is also very easy to follow! Just made this, house smells amazing but unfortunately my cake cracked pretty good 🙁 I’m sure I did what you said, most likely over mixed or had the speed on faster than i should have. It’s ok, trial and error! Can this be made in a deep pie dish? This looks so delicious! I’m going to attempt to make it for Thanksgiving, but I have 2 questions. 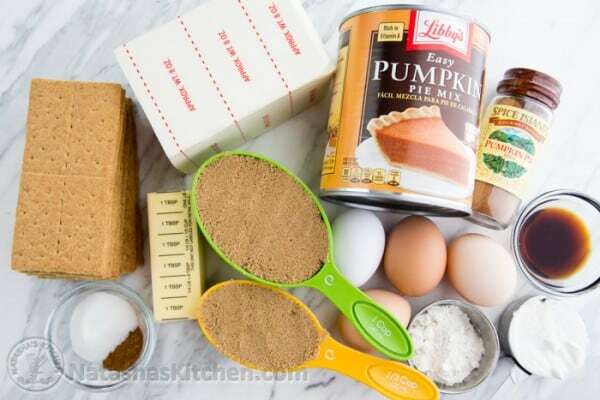 1) There is a can of pumpkin pie mix in the picture, but the recipe says to use pumpkin puree. Which one do you recommend? Natash, do you bake the cheesecake on the top or middle rack? What level do you have it on in the oven? It works best on the middle rack. Also, what kind of pumpkin puree did you use? Sometimes a homemade one that is too wet might cause cracking. Finally, did you follow the instructions to mix on low speed once the egg mixture is added in? 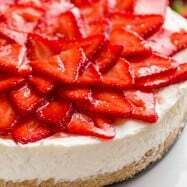 Whipping on higher speed can cause air bubbles to enter the cheesecake batter and create cracks later. I hope that helps! Hi Natasha, thank you for this incredible recipe!!! I made my first ever pumpkin cheesecake and it was really good!!! We live in US for 4 years and we never even wanted to try it, the color isnt attractive and the main ingredient the same…. BUT your mouthwatering presentation intrugued me AND I decided to give it a try by the end;))) and every one (even two my little ones) in my family enjoyed it!!! I would never thought that it can turn out that delicious with pumpkin!!!!! The only thing I wonder why I had a crack in the middle??? (I’ve covered it with cream and caramel sauce, like it wasn’t there at all;))) )… But still why?? ?